“Highly recommended.” Author Colleen Coble. The Bracelet is the first book by Dorothy Love that I’ve ever read. The title, the beautiful cover and the description of the book made me want to read it. The title was alluring. It is a short title, only two words, but they had a strong magnetism for me and I knew I had to read it just by reading the title. The book cover is gorgeous. The image of this feminine girl immediately sets you in the time period, it takes you back in time and gives you the sense that you’re about to read a historical and romantic story. However, although it is a pretty book cover, it lacks in my opinion the sense of mystery. As you read the blurb and after you finish reading the book, you feel like the cover depicts a historical romance story only, and it fails to deliver the message that the story is about uncovering the mystery behind family secrets. But like I said it is a pretty cover. The girl in the cover feels like she is staring right at you. A very powerful stare. The Bracelet has a good and classic cast of main characters. A line up you would expect in historical fiction stories like this one. Starting with Celia Browning, our main character. She’s the only daughter of prominent family, educated at a fine female academy of Atlanta where she learned the fine arts of being a Southern socialite. Celia is devoted to planning events, volunteering/helping at charities (being the improvement of the lives of the girls at the Savannah’s Female Orphan Asylum her favorite), and also preparing her wedding as she is certain she will be engaged to her childhood sweetheart. But don’t think of Celia as a useless egghead, even though her actions depict her as a classic southern belle, she feels somehow constrained by the norms of society in which marriage, motherhood, and charity work were the only permitted aspirations for women. Ivy, Celia’s older cousin who came to live with the Brownings when she was orphaned at age 10. She’s the classic misfit cousin: jealous, dark, and mysterious; who, despite of being treated as a member of the family and getting the same education as Celia, thinks of herself as the worthless “poor relation” that the Brownings pity. A character you know will cause conflict in the story. David Browning, Celia’s father, the fourth richest man in Savannah & owner of the Browning Shipping Company. Mrs. Maguire, the housekeeper/nanny, who has been key in helping Mr. Browning raise Celia and Ivy and who knows more about the family than what she appears to. Leo Channing, the nosy newspaper reporter, who is determined to dig, revive and make public the tragic mysteries behind some “accidental” deaths in Celia’s family, no matter the consequences or who he hurts for the sake of getting the scoop in what he thinks is a great scandalous story that will make him famous. The story is set in Savannah and loosely based on true events (the Sorrel family), a fact that for me made it appealing to read. It takes place in 1858, so the conflicts between North and South regarding slavery, secession and war are still palpable. It is not a book about slavery per se, the family portrayed isn’t a slave owning family, but being that it takes place during the Pre-Civil War time period, the situation is addressed. The plot was good. After receiving a mysterious bracelet with what seems an omen of death, Celia decides to take matters on her hand by discovering on her own the mystery behind the bracelet and the true series of events of her family’s past in order to stop the despicable reporter, who is trying to ruin her family. I was intrigued about the secrets behind the deaths. I kept trying to guess what would happen next and who did what. I questioned Celia’s actions and I kept suspecting on Ivy. I had a love and hate relationship with Ivy, just when I thought she might not be the bad guy, she did suspicious things. I never trusted Ivy but at the same time I suspected she would end up being a victim too. As I kept reading, the plot kept getting tangled, but tangled in a good way. Gladly in the end, it all made sense and they lived happily ever after. I liked this story, it kept me entertained. I gave this book a rating of 3.5 out of 5 because even though it was an enjoyable and interesting read, overall I felt like it didn’t fully meet my expectations. I mean the blurb said this was going to be a story of “romance, rich historical detail, and breathtaking suspense”. Yes, it had romance but it was too predictable for my taste. Yes it had historical facts but I didn’t feel like it was that rich, for rich historical details there are textbooks. Yes it had suspense but it wasn’t breathtaking and I think the Ivy situation got resolved too easily. I wish I could’ve read it in one sitting, maybe without the pausing I would’ve found the suspense a little more close to breathtaking, emphasis on maybe, because I doubt the suspense would’ve shocked me in order to give it one more star. Another factor that took points from giving this book a higher rating was that despite the classic cast of characters, there was one character that I felt got a bit robbed. An important non-human character: The Bracelet. I mean the title of the book hints you that this item has to be a big thing in the plot. I got excited when the bracelet finally made its appearance. The language of the jewels fascinated me (a Victorian custom in which gentlemen sent hidden messages to their sweethearts through the language of the jewels. A suitor might send a brooch or a bracelet set with jewels, and the first letters in the jewels’ names would spell out such endearments as “adored” or “dear.”). But in my opinion the bracelet had to have a more significant role in the story and not be treated only as the tip of the iceberg. It is only the first link in the chain of events/things/people that help uncover the truths that were supposed to be buried and hidden in the past of the Browning’s life. The title would’ve felt more coherent if the bracelet had more prominence in the story. Other than that it was a good read and I liked it. 3.5/5 is a good rating in my scorebook. 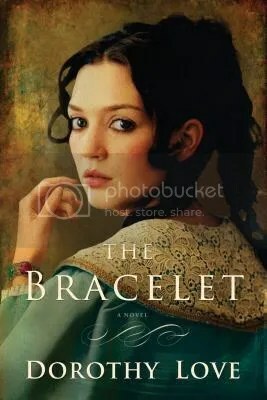 The Bracelet is a story of mystery, secrets, death, murder, rivalry, and love that readers of historical fiction will enjoy. If you’re into love stories about wealthy southern belles this is the book for you. If you’re looking for a book about slavery, this is not the book for you. If you are looking for a book about a wealthy southern family in the 1850’s that didn’t own slaves, this is the book for you. This was the first book by Dorothy Love that I’ve ever read. I wasn’t aware that she is a Christian writer. If you’re expecting this to be a Christian fiction book, this is not the book for you. Having read the book I would say the Christian message was so subtle that I didn’t find it. There are no crude offensive language or events, which makes it a safe book for readers who worry about that. The Bracelet is a good book for young adults, adults and book clubs too. I can see discussions about dealing with sibling rivalry, family secrets, and/or women’s societal roles coming from reading this book. I enjoyed Celia’s story and I will definitely check out Dorothy Love’s next historical romantic suspense novel that will be released in October 2015. Haint: noun. Southern colloquialism for ghost, apparition, lost soul. Harangue: verb. Lecture (someone) at length in an aggressive and critical manner. Unctuous: adjective. (of a person) excessively or ingratiatingly flattering; oily. Drayman: noun. A person who delivers beer for a brewery. Sully: verb. To damage the purity or integrity of; defile. Abscond: verb. Leave hurriedly and secretly, typically to avoid detection of or arrest for an unlawful action such as theft. Assuage: verb. Make (an unpleasant feeling) less intense. Loll: verb. Sit, lie, or stand in a lazy, relaxed way. He was quick to laugh, slow to anger, quick to forgive. Mrs. Lawton was everything Celia herself hoped to be—gracious, compassionate, and beautiful even in maturity. She had done her best to emulate the best qualities her mother was said to possess: graciousness, discretion, charity, piety. “It’s very kind of you, Mr. Shaw, but I cannot possibly accept this.” She returned the box. Small-minded people always need someone else to look down upon, whether or not it’s warranted. Lose an hour in the mornin’ and you’ll be lookin’ for it all day. It’s the latest thing according to the magazines. Gentlemen send secret messages to their ladies through jewels. The first letters in the names of the jewels spell out a message. Springtime in Paris can be quite chilly.